Today I'd like to take the time to plug three cool things that you should check out while you're waiting for me to actually write something original. Well, I've written quite a lot of original things recently (I'm in two different writing classes this quarter, so I have a bunch of silly little short things that I've written for school). I just haven't posted them here cuz they didn't seem "bloggy" or "RuneScapey". Anyway, instead, I'mma point out some other cool things that you should check out. This is GrindScape. As far as I know, it's the only regularly-updating RuneScape webcomic out there. (If you know of any more, drop a comment on this entry!) And it's not bad. If you like RuneScape and you like webcomics, give it a look. It's still young, so if you jump in now, you can read all the archives without having to stay up all night! Quick! If any of my readers are or have young'uns, I suppose I should warn you that it contains explicit language and stuff. So heads-up, I guess. 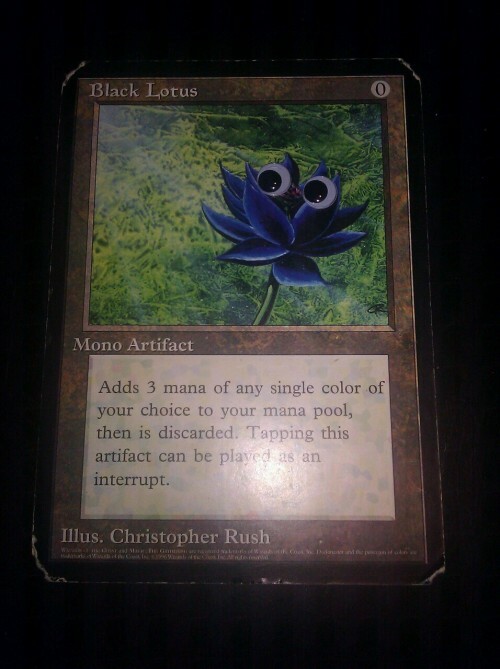 Magic cards with googly eyes. And lastly, Super Smash Land. It's a demake of Super Smash Bros. So, it's like if Smash Bros were a Gameboy game. And as you can see from the trailer, it's pretty sweet. Yes, it is a playable game, with three different gameplay modes (Classic, Endless, and Versus), four starting characters (Pikachu, Link, Mario, and Kirby), two unlockable characters (Megaman and Vaporeon), and, oh, you can download it for free! The official website is http://supersmashland.com/. If you're a fan of Smash Bros (and who isn't? ), I guarantee you'll at least get a kick out of it. Okay, that's my plugs for the week. Well, okay, one more, a little more self-serving: W22 Fishing is recruiting! We could use some more hands to work the Fishadel. Interested in cheap, quick mining/firemaking/smithing/woodcutting xp? Visit this thread. Anyway. 'S good stuff. Have fun.